We provide a wide array of Bimetallic Connectors for twin conductor. Tee connectors are fabricated with stainless steel, iron etc and used in joining three wires of an electrical line. Leveraging on our industrial experience 11 years, we have achieved an outstanding position in the market by manufacturing, exporter and supplying an excellent quality range of Transmission Products and Equipment. Our range includes GS Oval Eye Bolts, Insulator Pins, U.P.G. 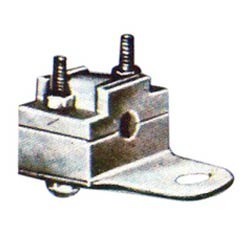 Clamps, Tension Clamps Horn Holders, Bimetallic Connectors, Earthware Type Tension Clamps, TC Clamps ( B&S Type), Horn Holders Sockets Clevis, PG Clamps for Dog to Dog, Pole Top Pins, Earthware Tension Clamps, Conductors, Single Bolts T & C Clamps, Automatic Come-Along Clamps, Earthing Tension Clamps, Tension Clamp Horn Holders, Earth Bonds, Hardware Fittings, Hardware Fittings, Double Suspension Hardware Fittings, Double Tension Hardware Fittings, Vibration Dumpers Hardware, PG Clamps. Our experienced personnel use quality raw material to manufacture these products, which is reckoned for its reliability and tensile strength. State-of-the-art infrastructure is developed by us, where our entire range of products is manufactured in compliance with the defined quality standards. Moreover, stringent quality control measures are developed by us, which are efficiently performed by our experienced quality auditors in order to ensure that our products are of excellent quality. Further, to make the delivery of consignment within a prescribed time, we plan our entire business activity carefully and systematically.